No, this wasn’t the Seattle-To-Portland (STP) bicycle ride. Or the Ragnar Relay, an 187-mile relay race from Blaine to Coupeville, Wash., also this past weekend. 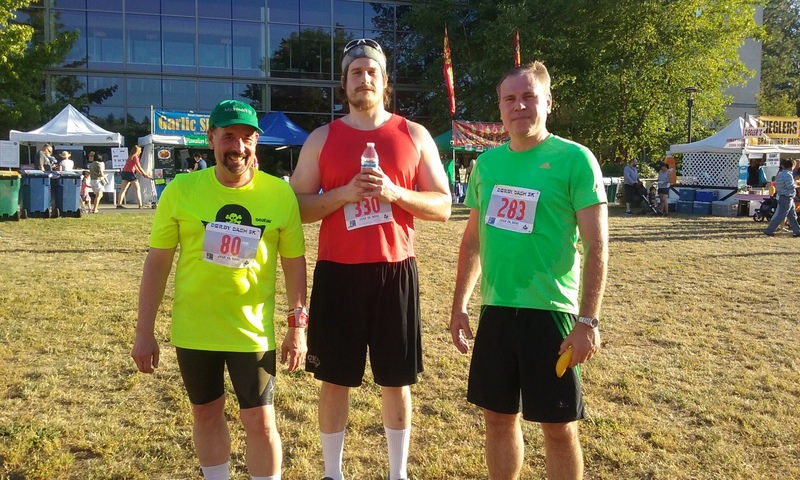 This was only the Redmond Derby Dash 5K, a 3.1-mile run after work on Friday. But I am still going to complain about the heat. It’s my best excuse for running a slower time than I wanted. Temperatures were in the upper 80s in Redmond on Friday, July 13, but with the humidity, it felt worse. And on the stretch of the Sammamish River Trail where we raced, shade was limited. 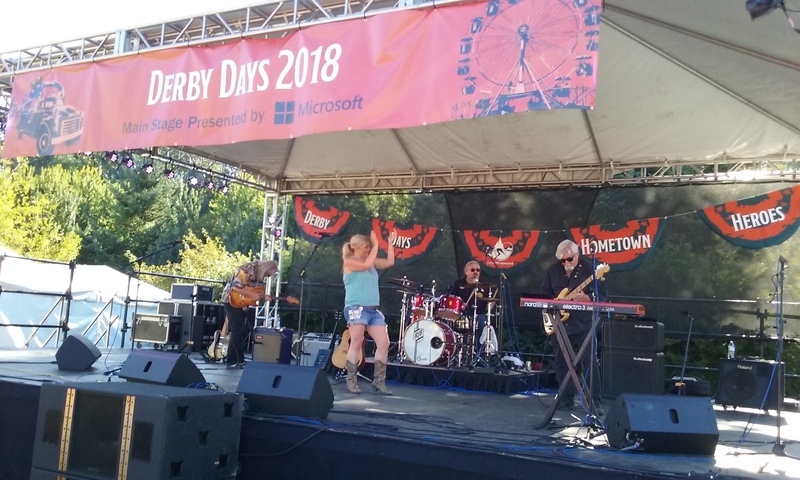 This road run is part of the annual Redmond Derby Days festival, and also featured a band, food trucks and a beer-wine garden. The up-and-back course is meant for your fastest 5K of the year, but not for me this year. It turned out to be a harder, more taxing run than I was expecting, and my last 5K at Marymoor Park was faster. I got by with a little help from a few friends, Allytics colleagues Brian Vander Yacht, Chris Saleski and Kerry Stevenson, who were running the race for the first time. The course started and ended behind Redmond City Hall, about a mile from our offices in Redmond. 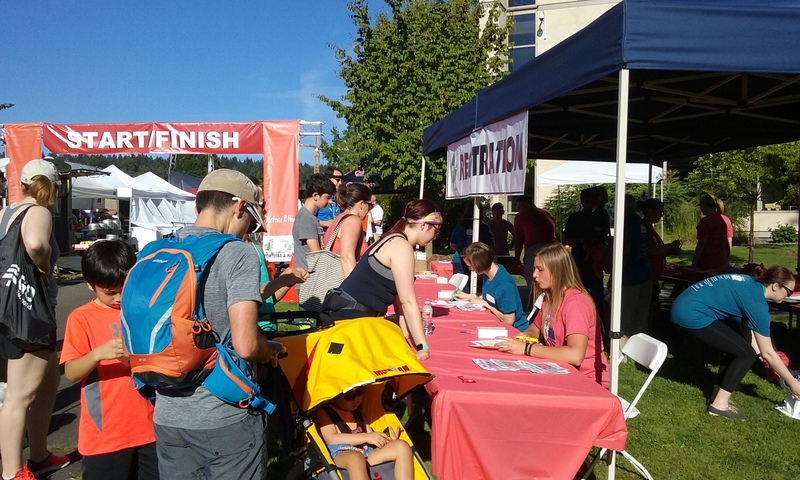 Some 382 people signed up for the run, and there were 367 finishers — runners and walkers of all ages. Overall, the times seemed to be a bit slower than normal (not just mine) because of the heat. For example, 21-year-old Devin Wolff (a University of Portland runner) finished in first place for a second year in a row, but his winning time this year was 16:18 (5:15 per mile), compared to 15:54 a year ago. Also, there were 36 people who took more than an hour to complete the race, compared to only nine in 2017. I finished 190th at 39:05 (12:35 per mile), behind my time of 37:08 (11:59 per mile) last year and 35:40 (11:29 per mile) in 2016. (My PR is 24:32 in 2005.) I’d like to use my ankle as an excuse — it was my fourth road run since ankle surgery last December — but I really can’t. I am a few steps slower these days, but my ankle pain is minimal (#knockonwood). Thanks, Dr. Powell. It was good to see my workmates run well. All beat me — Brian finished in 29:56, Kerry in 34:18 and Chris in 38:19. Full results are here. In early June, Kerry ran her first marathon, the Rock ‘n’ Roll Seattle Marathon, so this was a short, flat, change-of-pace run for her. Congrats to all of them! Shout out to Brian too, for a fine effort in his first road run. 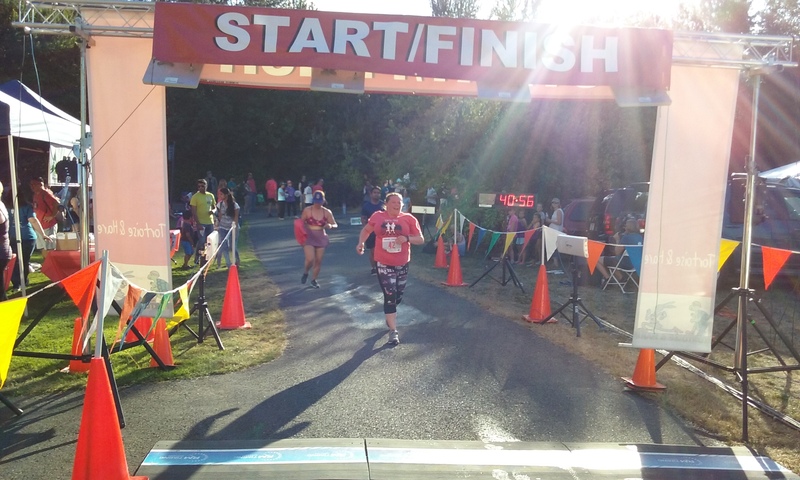 The former offensive lineman for Central Washington University beat 30 minutes for his first 5K, and should be under 25 minutes soon if he stays with it. 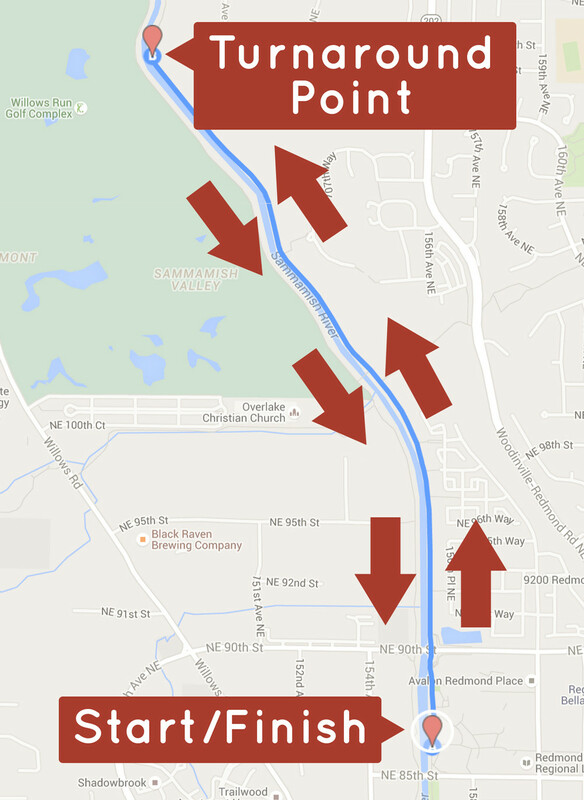 The Redmond Derby Dash 5K is run on the busiest stretch of the Sammamish River Trail. 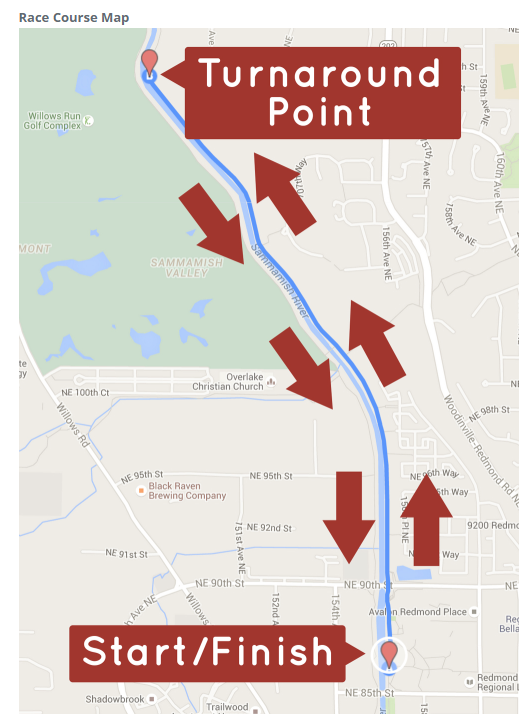 The 10.5-mile trail used by many bicyclists commuting home from Microsoft, as well as skaters, skateboarders and pedestrians just out for some exercise. The good news is that I didn’t see or hear about any accidents or collisions between the runners and trail users this year. Two years ago, I had to fend off a skateboarder about to plow into me in the last mile of the run. It could be that the “Alert” signs about the run, placed in spots along the trail over the past two weeks, caused some users to avoid the area during the race. Not having to dodge many bicyclists and skateboarders made the run better this year, but the heat was exasperating from the start. 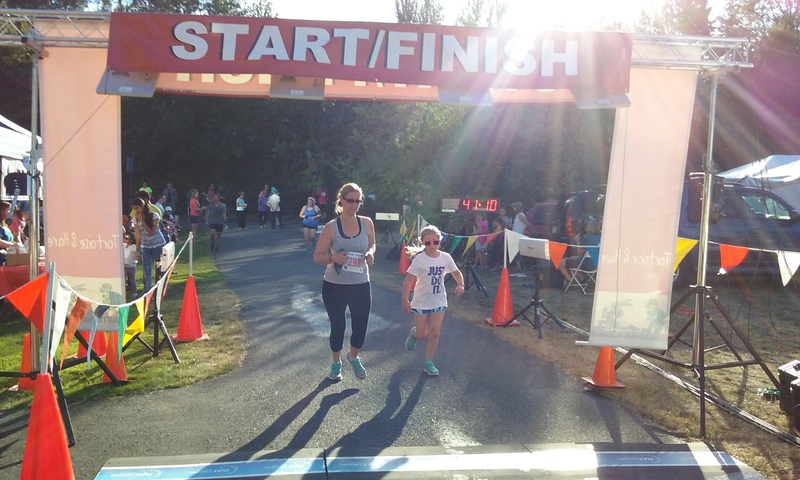 The race started at 6:30 p.m., after the work day, but it hadn’t cooled down any as the heat wave through the Seattle area was in full swing leading into the weekend. During the week, I told the other Allytics runners to get off to a good start, hold steady through the turnaround at the halfway point, then try to turn on the speed coming back to the finish line. I did get off to a good start, then got winded. I labored to get to the turnaround, and then didn’t have much of a finishing kick. But I finished. In one piece. It was my 217th road run since 2001, all without a DNF. 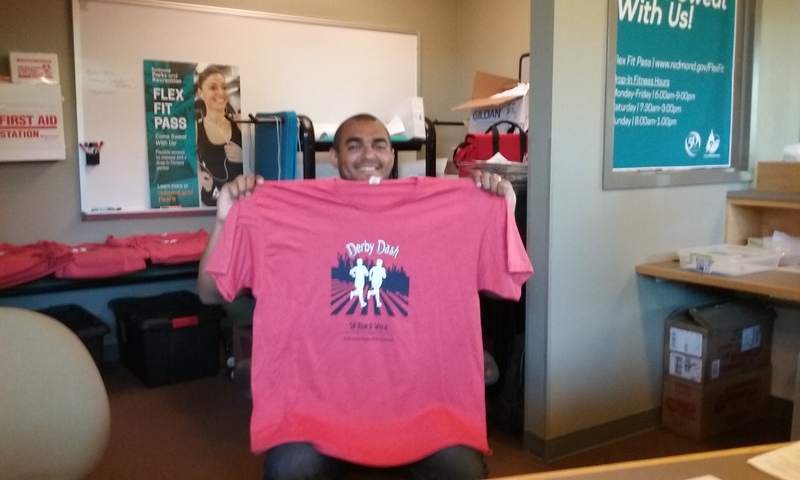 Looking forward to my next run, the Seafair Torchlight 8K Run, which will also be at night on Saturday, July 28. But I’m looking forward first to an eight-day vacation to New York and New England. 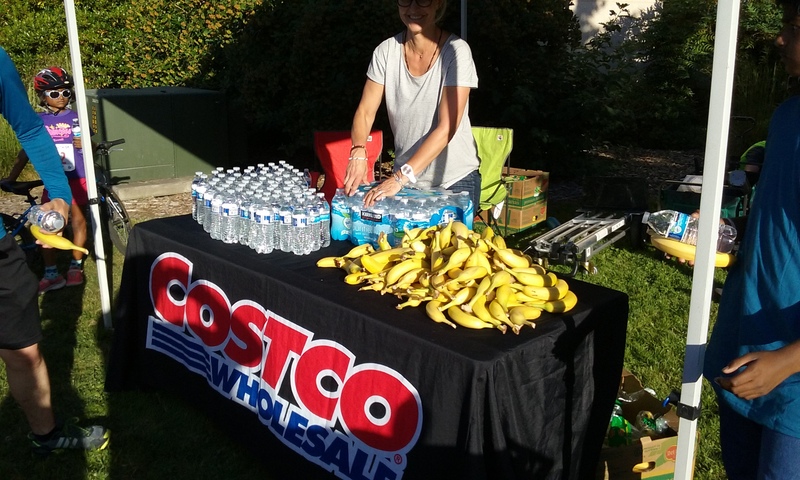 There are lots of possibilities for August, including the Obliteride Bicycle Ride on Aug. 11, the Lake Union 10K on Aug. 12, and the Seattle Marathon 10K on Aug. 26. We’ll see which ones I can do. RSVP on Aug. 17-18 is unlikely. Thanks for reading! See you after my vacation. 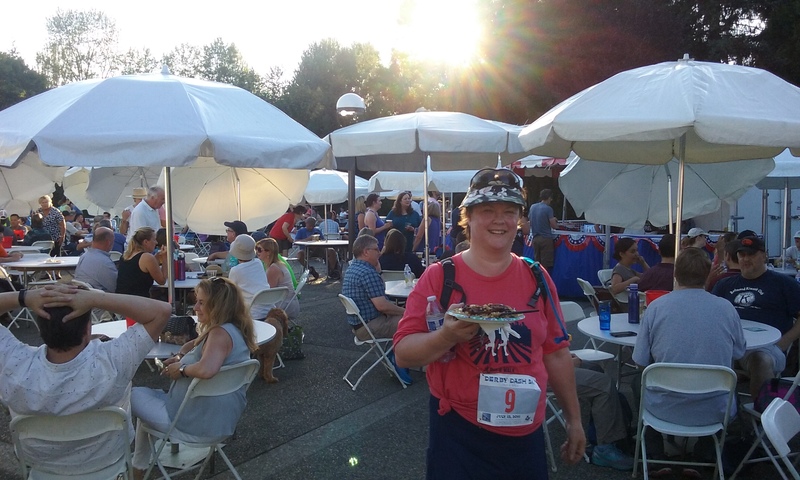 This entry was posted in 10K, 5K, 8K, ankle surgery, Bicycling, Marymoor Park, Rock 'n Roll Seattle Marathon, RSVP, Running, Sammamish River Trail, Seafair Torchlight Run, Seattle Marathon and tagged 5K, Allytics, ankle surgery, Bicycling, Marathons, Marymoor Park, Redmond Derby Dash 5K, Rock 'n Roll Seattle Marathon, Running, Sammamish River Trail, Seattle Marathon. Bookmark the permalink.